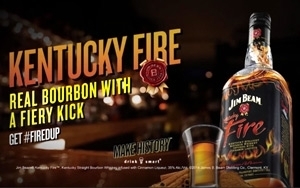 Jim Beam is targeting millennials with a digital video campaign for Kentucky Fire, its newly released cinnamon-infused bourbon. The effort, from San Francisco-based Mekanism (Jim Beam’s digital AOR), includes three videos featuring shot rituals proving that there is truly no wrong way to get #FiredUp. In "The Slow Burn" step one is to prepare your palate; step two, take a shot of Jim Beam Kentucky Fire slow. "The Kentucky Standard" features step one, order a round of Jim Beam Kentucky Fire; step two, drink it and "The Kentucky Tycoon" suggest ordering shots of Jim Beam Kentucky Fire for the whole bar, make it rain fire. The videos, which launched Oct. 6, are available on Jim Beam's Facebook, Twitter, and YouTube, and will run on various online, mobile, social and experiential channels such as ESPN, AOL, Kargo, Viacom, and NBCUniversal. The digital ads will run through early November. The Kentucky Fire videos give consumers interesting and comical ways to get #FiredUp when they’re out, he says.